We've stayed at five-star hotels throughout the world, but none prepared us for our stay at Las Ventanas in Los Cabos, Mexico. From the minute we entered the hotel lobby, where we were dazzled by the expansive ocean view and the architectural aspects of the lobby and veranda, we knew we were going to have a one–of–a–kind experience. The exceptional stay at Las Ventanas begins as soon as one steps off their plane and into the hands of a Las Ventanas representative. And, unlike most vacations, it didn’t end until our return flight left the ground from San Jose Airport in Los Cabos. While the beauty of this Five–Diamond resort is well known around the world and caterers to a luxury driven clientele, Las Ventanas sets a new standard in the hospitality industry for its personalized service, innovative amenities and romantic ambiance. All the amenities at the resort are superb but it is the experience of the Signature Villas that distinguishes this resort apart from other luxury properties. From the check in one-hour massage in the Villa to the full time butler, the thrill of having nothing to worry or think about during your the stay at Las Ventanas is worth every penny. 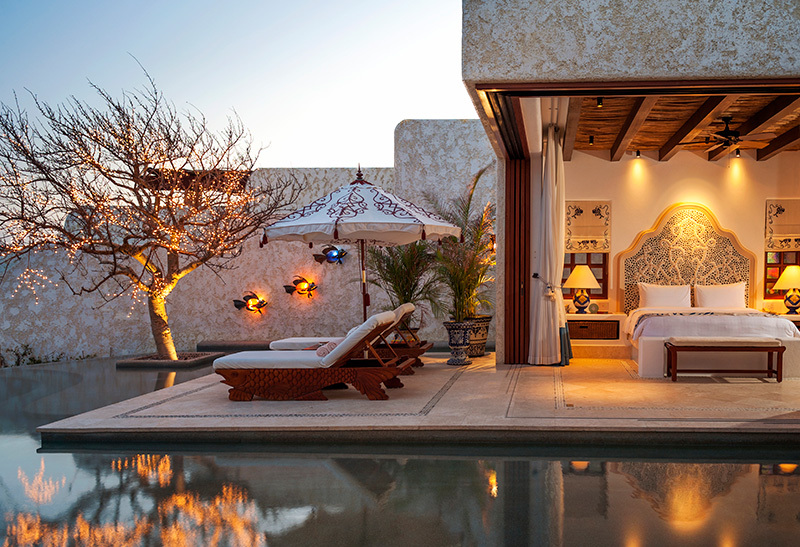 Designed by architect Jorge Torres from Cabo Development, each villa features a private infinity edge pool and swim up bar, which is surrounded by gardens of desert plants native to the Baja region. 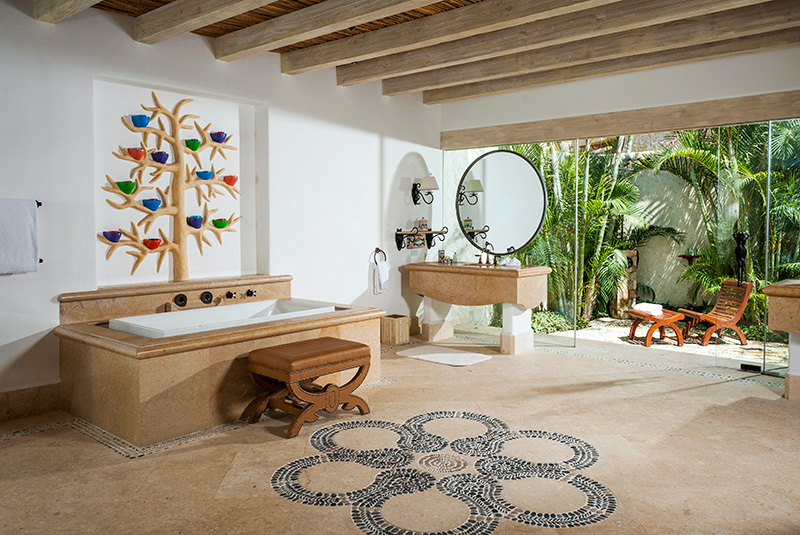 Authentic Mexico meets modern luxury with lavish bedrooms, impressive walk-in closets, and expansive open-air bathrooms featuring invigorating steam and rain showers, infinity bathtubs, and private outdoor garden patios. The villas' fluid indoor–outdoor design allows for the dazzling Los Cabos sunlight to flood the living rooms and bedrooms, creating a feeling that one is always outdoors. 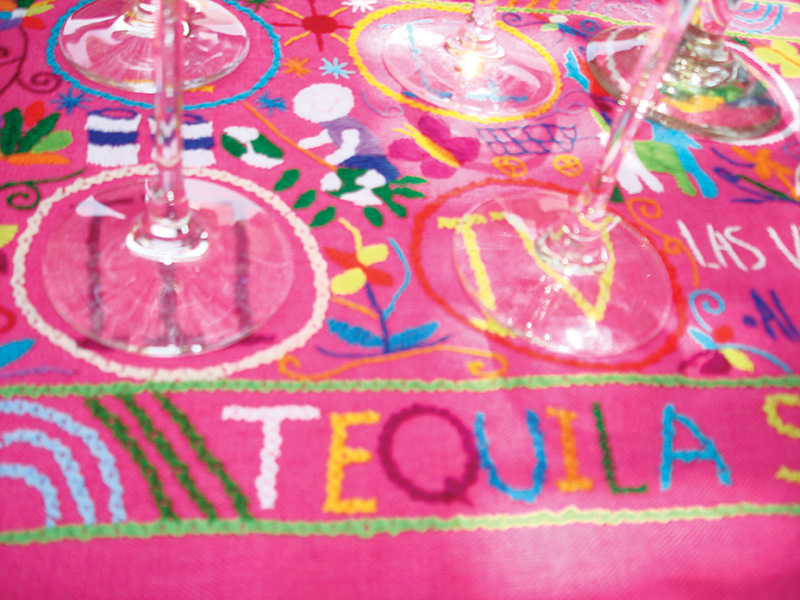 The walls of the brilliant white villas come alive with authentic, vibrant Mexican artwork and décor throughout, which has been carefully hand selected from cities all over Mexico paying homage to the country’s true spirit. Part of the Signature Villa experience is the dedicated, 24–hour butler who brings guests an unprecedented level of pampering and attends to their every whim. From delivering your fresh breakfast daily to making homemade guacamole and margaritas each afternoon and customizing the digital music library on the villa’s iPad, the personal villa butler ensures guests every desire is instantly fulfilled. Our butler, Daniel Sandoval, was there for us twenty-four hours and actually, since there were just three of us, all women, he happily engaged in conversations and we had many laughs with Daniel. His expertise in the kitchen was perfect. Wonderful drinks, appetizers and the best ceviche we have experienced. All food was made from fresh produce, fish or meat from local waters including the lobster dinner our first night in the villa. The Butler truly made a major contribution to our villa stay. To complete this exceptional villa project, Las Ventanas will debut an extraordinary 22,500 square foot master villa in early Spring 2016, offering guests a retreat into the lap of luxury. With 22,500 square feet of luxurious indoor-outdoor accommodations, the Master Villa is the crown jewel amongst the villa offerings at Las Ventanas. Also overseen by Jorge Torres, the Master Villa has been designed to be a scaled down version of the resort, offering exquisite details such as an 80-meter infinity edge pool set on the sparkling Sea of Cortez and an extravagant list of personalized amenities to ensure the ultimate experience in luxury and service. Starting at $30,000 per night, the Master Villa maintains the highest level of luxury, exclusivity and discretion. 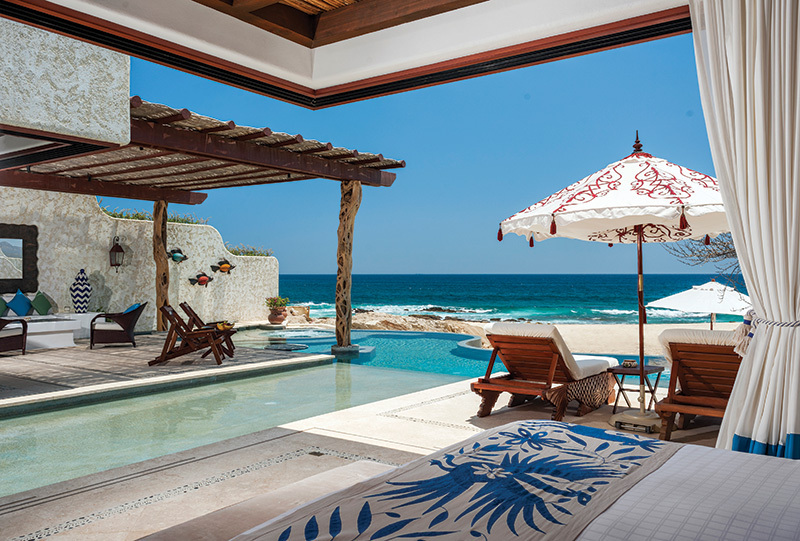 Las Ventanas is not only known for its beauty and superior service. The food, whether prepared in a private villa, or enjoyed in one of the three signature dining choices including a Mexican menu inspired by the distinct regions of Mexico at The Restaurant, The Sea Grill featuring 'La Marisqueria' and the Ceviche, Sushi & Tequila Bar, is what one would expect from a five star restaurant. The most extensive array of ultra amenities of any resort, including pool butlers at the world-famous infinity pool to luxury beach cabanas and a Director of Romance dedicated to making guests' romantic dreams come true, make time spent at Las Ventanas unforgettable. Furthermore, the newly renovated Spa at Las Ventanas is heralded as one of the world's top spas, featuring exquisite indoor-outdoor treatments rooms, private terraces, duet suites for couples, a serene solarium and new full-service beauty salon. 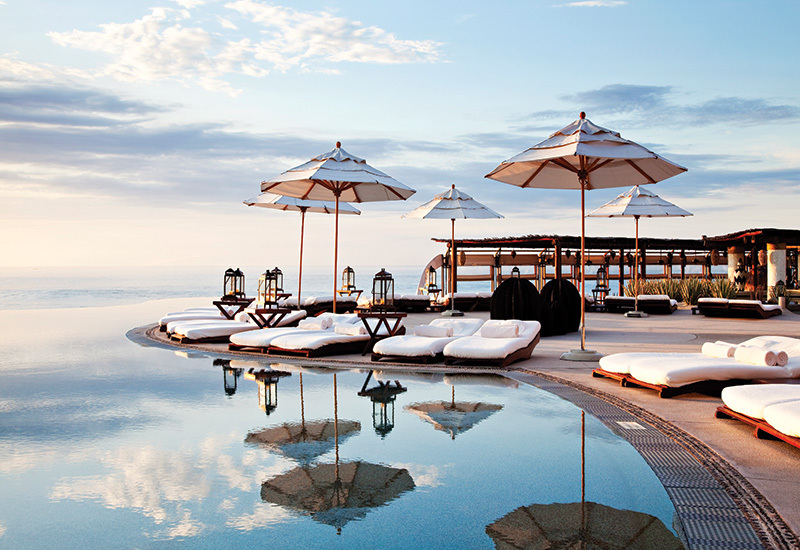 Las Ventanas is managed by Rosewood Hotels and is one of 18 one–of–a–kind properties in eight countries. Our experience at Las Ventanas was exceptional due in part to an amazing staff including Managing Director, Frederic Vidal, Resort Manager, Hector Serrato and Sales and Special Events Manager, Pamela Franssen. As with all those setting the standard at Las Ventanas, these managers make the difference between a good hotel or a grand resort. Each Rosewood Hotel embraces the brand's A Sense of Place philosophy to reflect the individual location's history culture and sensibilities. The Rosewood collection includes some of the world's most legendary hotels and resorts, including The Carlyle, New York, and Rosewood Mansion on Turtle Creek in Dallas, Texas. 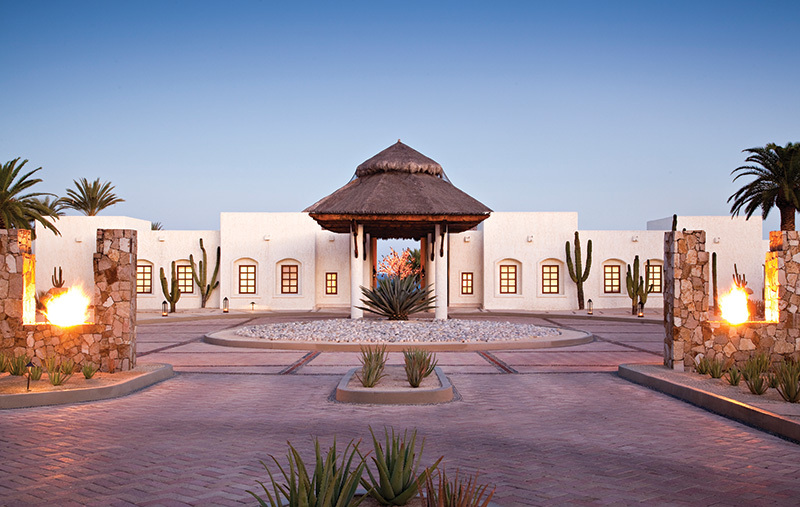 Las Ventanas is part of Ty Warner Hotels & Resorts, LLC founded by entrepreneur Ty Warner for the purpose of acquiring one–of–a–kind, irreplaceable luxury hotels and resorts throughout the world. 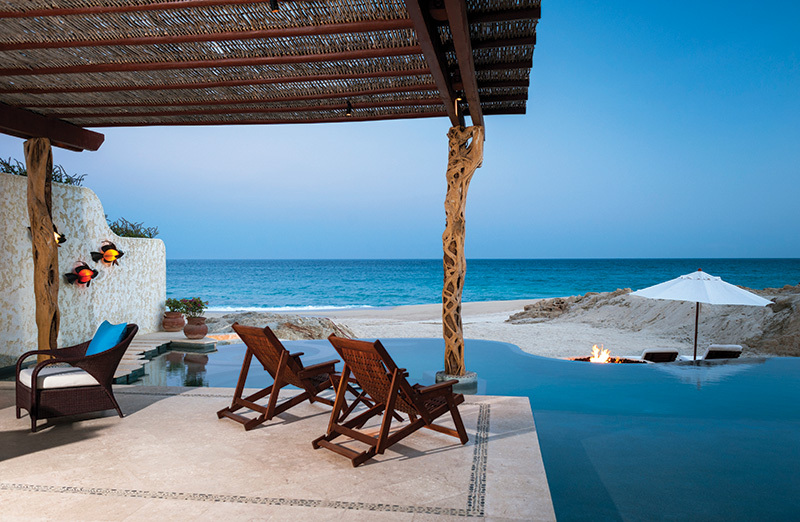 He certainly accomplished his goal when acquiring Las Ventanas Al Paraiso in Los Cabos, Mexico.